Carrie Bailee currently lives in Melbourne with her two daughters. She is a spoken-word performer, poet, blogger, advocate and motivational speaker. Carrie tells her story to honour the capacity of the human spirit to rise above trauma. 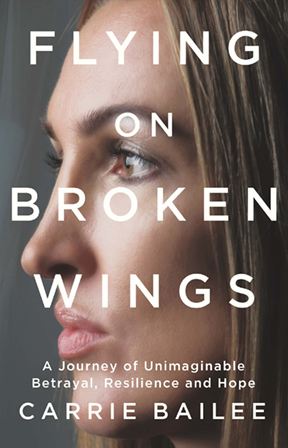 Her intention in publishing her memoir, Flying on Broken Wings, is to bring awareness to the fact that the severe abuse of children and organised criminal rings exist in our own backyards. Most importantly, to share her message of hope and resilience by transforming the victim trauma story, and speak to the possibility of what can be achieved when we have inner drive, a sense of worth, and the love and support of others in our lives.